San Francisco Planning Commission orders renegade developer to rebuild an exact replica of the house he tore down. 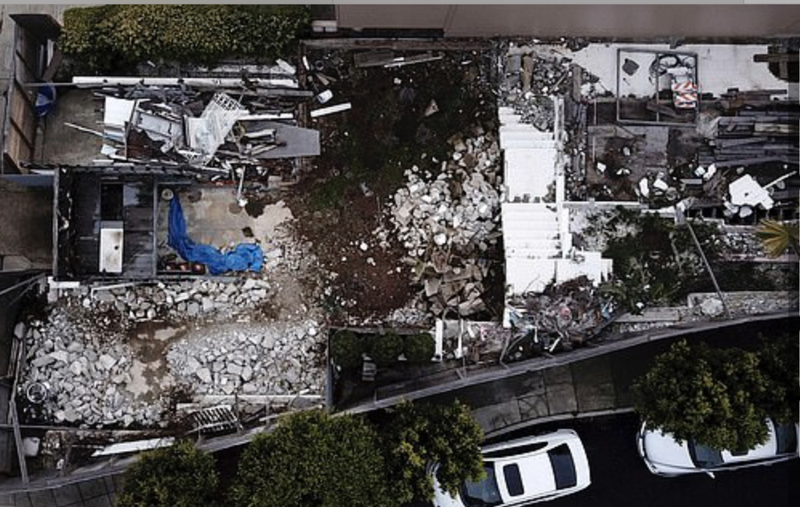 A San Francisco man has been ordered to build a replica of a landmark house he illegally demolished to make way for a mansion that would have been triple the size. It was an unprecedented ruling from the San Francisco Planning Commission, which wanted to send a strong message about the developer's actions. The Largent House, which was built in 1936, was 1,300 sq ft and featured an indoor swimming pool. It was located in San Francisco's Twin Peaks neighborhood. Johnston had planned to remodel the two-story home and submitted plans to the city that mostly kept the first floor intact. His permit was approved. But his neighbor Cheryl Traverce was shocked to find the house completely gone, save for a garage door and frame, when she returned from a vacation. Johnston later applied for a retroactive demolition permit and asked to build a new three-story house that would expand the size from 1,300 to nearly 4,000 sq ft.
'We acknowledge and apologize for the fact that a small portion of the work exceeded the scope in the approved plans,' he said. The planning commission unanimously voted to order Johnston to build an exact replica of the design. They also want Johnson to include a plaque that tells the story of Neutra's original house, the demolition, and the replica. 'The fact that it was a unanimous vote should send a message to everyone that is playing fast and loose that the game is over,' Aaron Peskin, a member of the San Francisco Board of Supervisors, told the San Francisco Chronicle. 'We want to preserve iconic, historic structures, but even more important, we want to protect our reservoir of more affordable housing stock. I trend towards the libertarian, do-what-you-want-with-your-own-property side of these arguments, but here there were regulations in place, the developer pretended to be playing by them, and lied. I think he got what he deserved. Tulip bulbs, Bitcoin, the US Dollar?